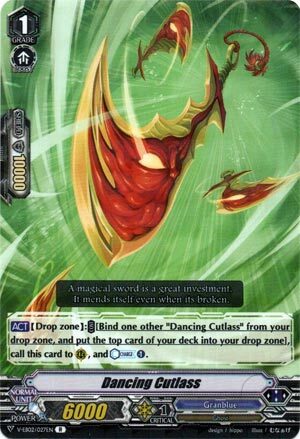 [ACT](Drop Zone):COST [Bind one other “Dancing Cutlass” from your drop zone, and put the top card of your deck into your drop zone], call this card to (RC), and Counter Charge (1). Well, once you have him set up he’s free and opens up Nightmist fuel to use again. He’s…okay? Or at the very least he’s not as horrible as he sounds. 6k is a bit low and you need time to set up Cutlass by milling or just guarding with it, which sounds a bit much for a card that doesn’t make numbers with anything except 12k+ attackers. Not that Standard Granblue doesn’t have any but would want to at least kill off Cutlass for something better if the option was there, sort of like Samurai Spirit (waiting on the promos here BTW). Not horrible but be sure to devote yourself to it if you’re running him because he demands lots of copies for consistency.